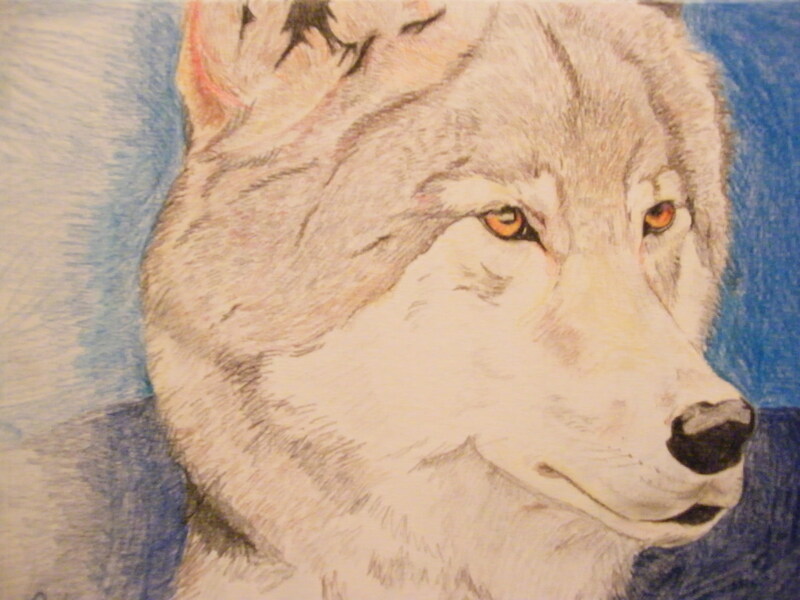 As early as I can remember (earlier, even, than my earliest canine sketch), I would always look out the car window at my wolf friends running along beside me, smiling at the world as they went. They would be easily clearing snowbanks and fire hydrants, loping around parked cars and children, who would be standing at attention and staring as we interrupt road hockey games in the suburbs; weaving gracefully through the oblivious throngs downtown, claws clicking on the pavement, patiently waiting with us at red lights before trotting on; and tirelessly charging along the transcanada highway or the 401…I’d sometimes catch glimpses of them through the forests, other times I’d track them trekking single file through a field half a kilometre away. Needless to say they were always happiest in the countryside along the highway, exploring, following smells and whims. But no matter where, they were always running, and always smiling. It’s hard to explain but everything about the wolf speaks to me. The stealth, strength, endurance, stillness, beauty, mystery, family values, instinctual, nomadic ability to survive, existing perfectly in its niche in the environment. In fact, I think my respect for the animal runs deeper than my respect for…well, gravity (which, by the way, I don’t believe is entirely immutable). Similar to gravity, as another basic law of my universe I expected a deep respect for wolves to be shared by all, at least to some degree. However, I was genuinely surprised to relatively recently discover otherwise, that people actually harbour fear of wolves! As Bertrand Russel said, “he who fears an animal will only see its threatening behaviour”. I encourage everyone to choose to respect and you will see much to warrant it! It’s funny that the characteristics that likely inspire fear in many people are precisely those that inspire me athletically: the predatory nature, chasing as if in a life or death circumstance, eyes on the prize with nothing else of any importance in the moment. The focus, drive, and courage of the hunting wolf are precisely what I attempt to emanate in athletics. I’m not suggesting necessarily that everyone must love wolves, but I am suggesting that everyone would do well to love and be open to learning from the natural world. I’ve had some awesome teachers throughout my schooling, but I assure you, none have been quite like the wolf!